How to get married in California in a destination wedding ceremony. L.A. is one of the easiest Elopement Destinations. Elope in Los Angeles with a destination wedding ceremony! easily. People come from all over the world for a Southern California destination wedding ceremony. It’s a great city to visit. If you would like to Skype, please arrange a time to Skype via email to meet up on OfficiantGuy Skype account. Is your destination wedding in Los Angeles or thereabouts? Many people have told us, “I want to get married in California, but I don’t know if I can because I don’t live there.” No worries. The Officiant Guy is here to help you. Chris Robinson is a specialized notary authorized by extensive training by the State of California and the Los Angeles County Clerk’s. He is authorized to office to issue California confidential marriage licenses. So he can both issue your wedding license to be married and officiate your destination wedding ceremony anywhere in Southern California. He’s incredibly accurate in his marriage license paperwork. The LA County Clerk’s office has suspended many specialized notaries in Los Angeles County for mistakes made on their marriage licenses. Chris doesn’t make those mistakes. He’s never been suspended. Nor has he ever been on probation. He’s very precise. His legal training prepared him for accuracy in paperwork. If there is a mistake on your wedding license then the County Clerk’s Office will reject the marriage license and require a duplicate to be processed. You don’t want to have to deal with that on your honeymoon, do you? Chris will hand-deliver your marriage license back to the LACC to be filed. Then a marriage certificate (that certifies that you have been officially married) will be issued to you quicker and without error. Too many officiants will mail in the marriage license assuming that the mail will not be lost. That will never happen to you if you pick Officiant Guy as your wedding officiant. Chris has officiated thousands of weddings over two decades. So he can guide you easily through the process of a destination wedding ceremony. Nothing throws him off. Your marriage ceremony will be very smooth and carefree. Chris has been to every possible wedding ceremony site in Southern California. He can make recommendations if you have something in mind, but don’t know where to go. Chris’s level of sophistication, sense of humor and easy demeanor makes the wedding about you, and puts the focus on your relationship. He takes his role seriously, but more importantly, he gets it right. Are you coming from out-of-state or even out of the USA and need to get married? No problem. Chris has married many visitors traveling from other states and from other countries who want to have the perfect Southern California Wedding. 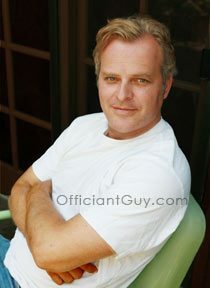 Officiant Guy is a Los Angeles marriage officiant who can make it easy for a destination wedding ceremony. You do not have to live in California in order for us to marry you here or provide a marriage license for you. California residency or American residency is not necessary. And if you just traveled here to Southern California and are inspired to tie the knot immediately we offer same day marriage with license services. 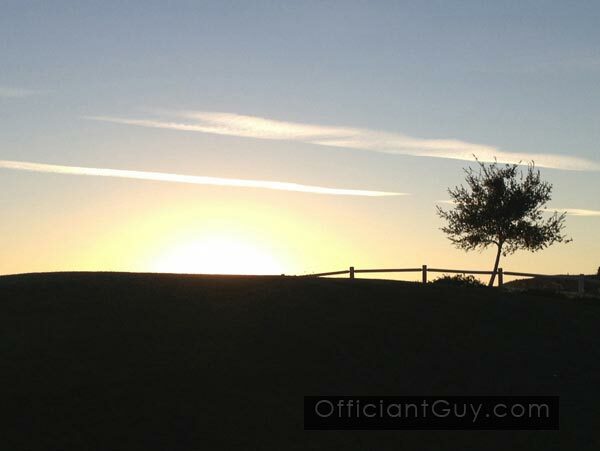 Call Officiant Guy today, and he can quite likely help you get married within a few hours. If you are long distance or overseas, Chris’s Skype account is: OfficiantGuy. Please email in advance to use it. We can provide you with a variety of sample wedding ceremony scripts that you can choose from. Or if you are so inclined, you can come up with your own wedding service ideas. You must been living together as man and wife. However, the County just states that. They don’t specify how long you have been living together. We guess they figure it’s none of their business. Your certificate of marriage is sealed from public record, so it remains private to you- – meaning no media, no solicitors, no telemarketers. 1) the information on this page California Marriage License. 2) One valid piece of government photo identification from both the bride & groom. 3) a copy of any divorce decree or annulment (if any) that took place in the last 2 years. Many of our clients come from other countries that require an apostille or certification sent to them as soon as possible. It can be very difficult to understand where to go, who to see, and who to keep in contact with when you are from a foreign country. We have navigated this bureaucracy many times before. Chris, being an attorney, can be your United States advocate. He can assist in submitting your marriage license to the appropriate authorities. By doing so he can get your apostille to you quickly. It can be very tense dealing with the goverment in these matters. Let Chris do it for you and send your apostille to you by Fedex or any service that you require. Don’t know where to get married in Southern California area? We can help and give you some ideas about a good wedding location in southern California. We’ve performed ceremonies all over Southern California, from the Southern California beach wedding to the California outdoor wedding to the southern California golf course wedding, and can make some recommendations for either planned or last minute weddings in any Southern California wedding venues. Recent California state law changes now allow Officiant Guy to issue California confidential marriage licenses anywhere in California, not just Los Angeles County. Hooray for you!! That broadens the horizon of possible wedding locations. Los Angeles county is quite large extending from the shores of Malibu to Long Beach to the Inland Empire to San Fernando Valley to San Gabriel Valley to Pomona Valley. You can now get a confidential marriage license in Orange County. The beaches of Huntington Beach, Laguna Beach, Newport Beach and Dana Point in Orange County are quite beautiful for a destination wedding. Chris can officiate your ceremony anywhere in Southern California. If you are getting married in a destination wedding ceremony anywhere in Los Angeles County to Riverside County give the premiere wedding minister in LA or OC Counties a phone call at (310) 882-5039 or (562) 547-3255 or fill out the contact form. Chris Robinson is an LA County ceremony officiant. He has been officiating Los Angeles marriage ceremonies and providing Los Angeles wedding licenses for over several decades. He makes it very easy for you to have the kind of wedding you want, from a quick marriage ceremony to an elaborate wedding ceremony to beach weddings in Los Angeles, Orange County, Ventura Count or Santa Barbara County.